If you are someone who wants bright, colorful, blown out and smokey eyes that just captures the room’s attention. This one is what you should go for and you will find it working for you. Before we go any further you first have to make sure that this shade is for you. The general rule is that if you have fair skin try not to choose colors that are too dark or to bright. The purpose of having a shade is to accentuate your already beautiful features while not grabbing all the attention from the rest of your face. Make sure you have a light fleshy color for blending, a medium contrast for the base and the dark color for the actual smokey effect. The accepted standard use of an eyeliner, or a pencil is essential for this transformation. Make up brushes; the domed shape type is also needed to apply the smokey effect to your eyes. Please make sure you have clean brushes as it would influence the overall color of your shade, much like painting a picture with a color soaked brush. Optional but recommended supplies also include roll on shimmer and concealer. Steps: Let us pick up from after you have already done your eyeliner. Once you are happy with the shape and have all the supplies for the eye shadow wash your hands once more and get into the next phase. 1. Proceed to apply your primary light colored purple gradient eye shadow, be sure to have clean fingers before doing this to avoid irritating the sensitive skin surrounding your eye. 2. Apply your second gradient of purple eye shadow with a mac make up brush or any other appropriate substitute. 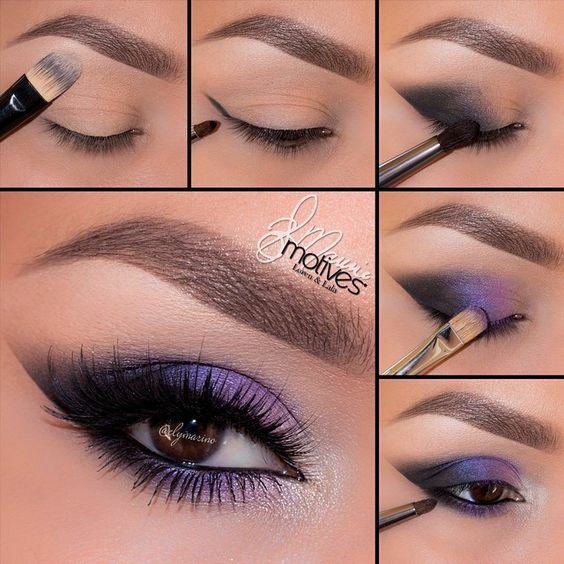 Apply the purple eye shadow starting from the upper outer region of your initial shade. Utilize the makeup brush by making circular strokes, much like the motion of a wind shield wiper. Blend the colors together just at the border of each color gradient. Also make sure to hit the creases to give it the full bodied look of a shadow. 3. Now with the fleshy tone makeup shadow blend another gradient of the colors on top of the border of your second shade. This time you should be concentrating on the skin surrounding the top most orbit of you eye closest to the eyebrows. Make sure you use an appropriate brush free of any color other than the shade you are currently applying. Continue to soften the edges of the previous shape to make the smokey effect more and more evident. 4. (Optional) if you have roll on shimmer on hand now is the time to use it. Roll on some shimmer on the back of your hand and with a finger proceed to lightly apply some of it to the middle of the first 2 shades to give it a glossy shimmer look. Do not be too liberal in applying as you do not want your eyes to look like a glazed donut. Less is definitely more when it comes to this stage. 5. And the last and often times most overlooked step of crating smokey eyes is the concealer. There are tons of products to choose from out there but the lighter the shade the better. Concealers work to help accentuate by smoothing out the surrounding wrinkle area of the eye. Therefore helping people focus more on the perfect shadow you have created. 6. (Optional) For some people who are not so blessed with long lashes this one is for you. If mascara is not enough to give volume to your lash area there is always the option of using falsies. To do this step before you apply your concealer and before you apply the roll on shimmer. I hope this tutorial helped you in your goal of creating purple smokey eyes. Remember to have the right shades suited for your natural skin color. Have the right supplies to apply the makeup with that includes make up brushes with the right shape and size. Use the right technique in applying and blending the colors for your eye shadow. And lastly have one or 2 of these roll on shimmer and concealer. Make sure you also check out our latest post for a different but also inspiring look, the 20 Gorgeous Makeup For Green Eyes post.